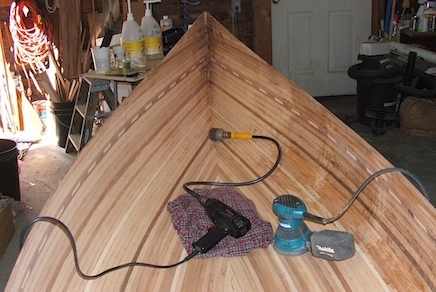 When I turned my canoe over, ready to work the inside, I was pleasantly surprised to find a minimum of glue and spaces between the cedar strips. I had taken the time to wipe up as much glue as I could with a wet cloth while I was installing the strips. Still, I know, a lot of sanding to do before fiberglassing the inside. 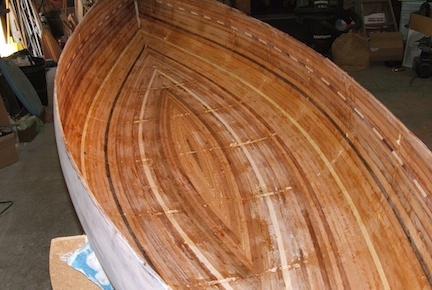 They say the job of sanding the inside can become a frustrating chore. This is true, but one must have patience and take all the time needed. I did find a tool that had been put away for years. My flex drill attachment with a drum sander. This makes a major difference in getting the glue and bumps in near the stems. After using the drum sander though, lots of hand sanding was needed. Because this canoe does not have made-up inside and outside stems I have filled the crevasse inside the stems with a fillet of epoxy putty. This will add strength in case of any hard knocks to the bow or stern. Also, the putty fillet smoothes out some of the rough spots way in there that are hard to get fully sanded. 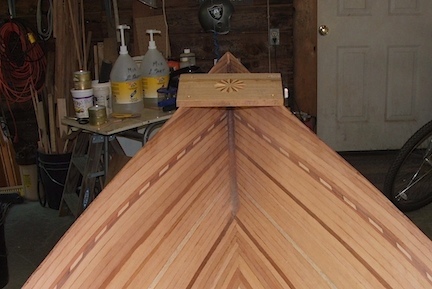 The sunshine is a mock up of the wood inlay that will go in the decks. 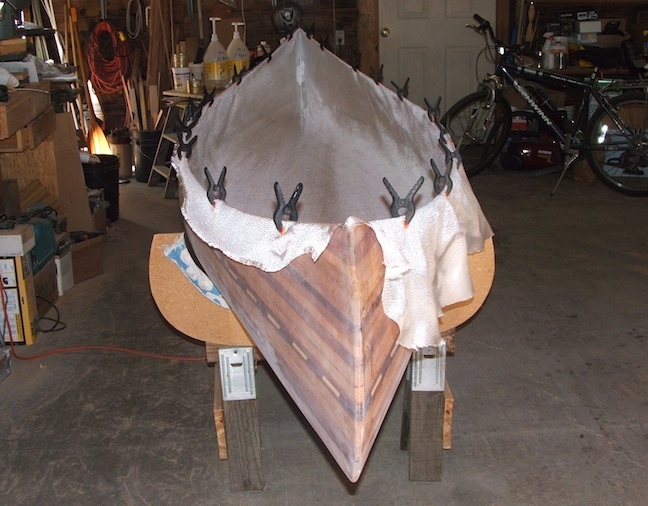 Here I have laid up the fiberglass on the inside in preparation for more epoxy. The trick now is to keep it smooth and down against the curve at the chines. The glass is cut about one inch short at the stems to allow it to fit more easily. An additional strip will be laid into the stems to complete the coverage. 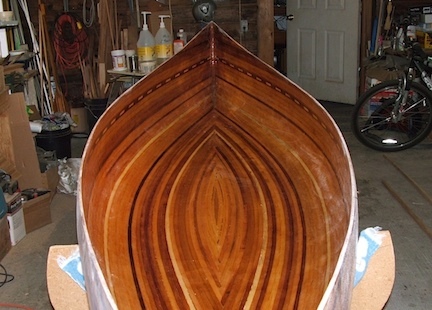 The fun part of building my canoe, the mixing and applying epoxy resin, is over. The inside is glassed with two coats of epoxy. Now there is more sanding to do. The bottom has a beautifully smooth coat of epoxy, and the sides came out quite well too, but the in the area of the chines there are a few runs that were difficult to brush out—so, some extra sanding there. Then, I'll have some nice woodworking to do on the gunwales, decks and seats.